A chronically constipated child is in (almost) permanent discomfort. Their belly is bloated, they are in pain, and they pass gas often, especially after a few days without a bowel movement. There are many methods that help kids poop every day. The key is to find the one (or ones) that work best for your child. Today I would like to talk to you about 5 natural remedies that fight constipation and that might just do the trick for your child. Give your child up to 1 cup of juice first thing in the morning. To make the juice squeeze the oranges with your hand. You can use of course a juice or a blender. If you use a juicer (this is the one I have for a few years now and works wonderfully), make sure you add a bit of the pulp back. The best juice is the one homemade as it still has vitamins (especially vitamin C) since it has not been exposed to high pasteurization temperatures (which destroy many vitamins) like the store-bought juices. If you have a juicer, all you have to do is to buy the fruit (organic is best) and make a cup of juice a day for your child. If your child is young, give them a few ounces first thing the morning. If they are older (at least 5 years old or so), they could drink the whole cup. I am not a big proponent of giving a child juice on a regular basis as all juice (including the homemade ones) have quite a bit of sugar. So I encourage you to rely on these sweet drinks only for a few days until your child starts pooping again. This is another remedy that has sugar, so again, use it only for a few days until your child can go to the bathroom easily. Mix 1 cup of water with 1 tablespoon of honey and 1 teaspoon of lemon juice. Give this tasty concoction to your child first thing in the morning. If your child is small give them only a few ounces and if your child is older they can drink the entire cup. For this you need a juicer and sauerkraut (pickled cabbage). Juice the sauerkraut and give the juice to your child. I realize this might not be a popular remedy among kids. You could add a bit of honey to it or you could dilute with 1 cup of water, but either way it is going to be a new taste experience for them. Give a few tablespoons of sauerkraut juice first thing in the morning to your young child or give ¼- ½ cup to your child if they are older. If you have an aloe vera plant, open it and take 1-2 tablespoons of gel. Mix the gel with a bit of water, juice, or applesauce and give it to your child first thing in the morning. If you don’t have the aloe plant, buy aloe vera juice from your local health food store and have your child drink up to a cup (depending on your child’s age) first thing in the morning. Among all the natural remedies that fight constipation I have mentioned so far, chamomile tea has an added benefit due to its relaxing effect. If your child tends to be anxious or is going through a stressful time at school, this tea will help them relax. Chamomile tea helps poop stay soft and come out easily. Steep a tea bag or loose chamomile flowers in hot water for at least 10 minutes. Remove the bag or the flowers. Allow the tea to cool off a bit until it becomes warm and offer it to your child. Add a bit of honey if your child likes it. The more tea your child drinks, the easier it will be for them to push the poop out. 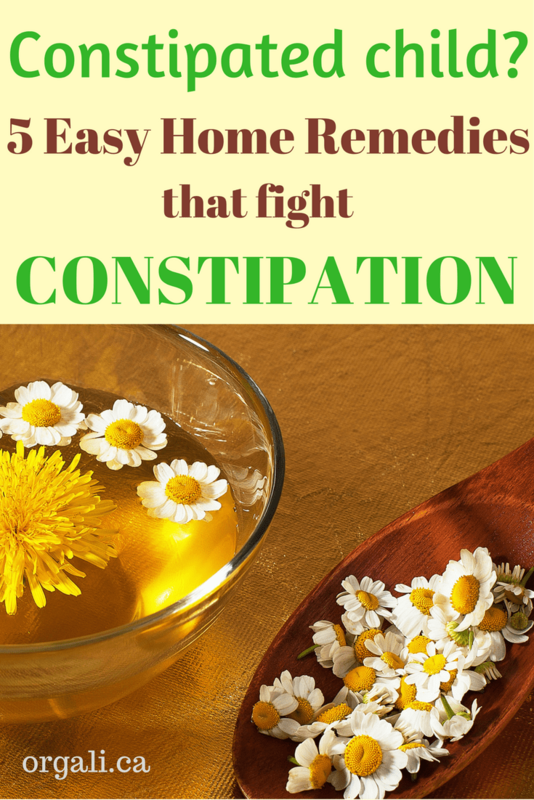 I hope you found these natural remedies that fight constipation useful and that you’ll try at least one of them. Did you like these 5 natural remedies that fight constipation? Are you hopeful that they will help your child poop easily? If yes, then these 5 quick and easy tips to help your child poop every day might be extremely useful to you and your child. I had never heard of sauerkraut juice! My littlest seems to get plugged up the most, I will have to try some of these the next time he does. Thanks for the tips! It’s not the tastiest thing, but it can be made tastier :). saving this one forever! we have gone through it in the past and I wish I had your tips! Bridget, I’m so happy I could help! Awesome Emily. Your son is doing great!